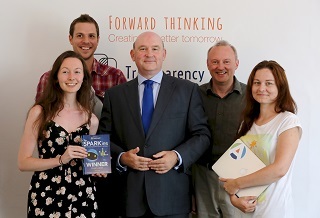 West of England Mayor, Tim Bowles, visited Bath-based health tech business, Mayden, on Friday 7 July, to see how it is boosting specialist skills to fuel growth. The company has set up its own academy to run intensive training in coding, software development and project management for potential employees, benefiting Mayden and other local businesses. Open to non-graduates and graduates, the 16-week course has already produced 18 work-ready software developers. Participants have included a former shelf-stacker, social care administrator and maths graduate. It has a 100 per cent success rate in getting participants into coding jobs within 90 days of completing the course. Mayden’s approach to improving the skills of potential employees was welcomed by the West of England Mayor: “This is a really innovative example of an employer investing in training local people and equipping them with the right skills for high-quality jobs. Geology graduate Charlie Coggans wanted to find a way into the world of coding after a career in digital marketing and hospitality. He attended an open day for the Mayden Academy and joined as part of the first intake of trainees to get intensively trained up in coding. Now he has been employed by the company for a year. He said: “Mayden Academy really suited me because it’s visual, well-resourced and there is always someone to answer questions. I saw a lot of online courses but I wanted to have a tutor on hand to be able to make coding come to life and learn as part of a team. Anyone interested in finding out more about training opportunities with Mayden should visit www.maydenacademy.co.uk or contact them at academy@mayden.co.uk. The West of England Combined Authority is made up of Bath & North East Somerset, Bristol and South Gloucestershire councils. It also works with partners including the West of England Local Enterprise Partnership, North Somerset Council and others, to deliver economic growth for the wider region.